The Customers tab is where you can see your members in the loyalty program. You can search for individual customers using their name, ID or email. Made a mistake? Click the "remove" button alongside the entry. This will immediately remove the points. Q. Can I give points to a large number of customers at the same time? Please remember that for cancelled and refunded orders - the points are automatically removed through LL so you do not need to manually adjust these. You can read about it here "Refunds and returns on purchased products"
*If you do feel a customer has not had their points deducted correctly or you want to deduct points from a larger group of customer, please email us at support@loyaltylion.com and we can look into this for you. This is usually used to block wholesalers. 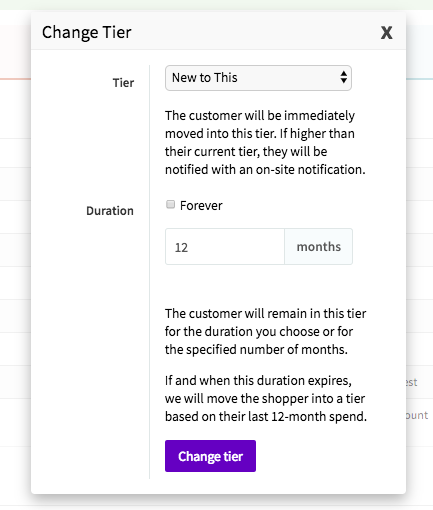 You can manually move a customer up or down the tier. Duration: choose how long the customer will stay in that tier. After it expires, we will move the shopper into the tier based on their last 12 months spend. You can move chosen customers up the tier for many reasons! It can be either for a campaign, surveys they've completed, reviews they gave you on different platforms, the number of referred friends - reward them for being a loyal customer or even a brand ambassador! 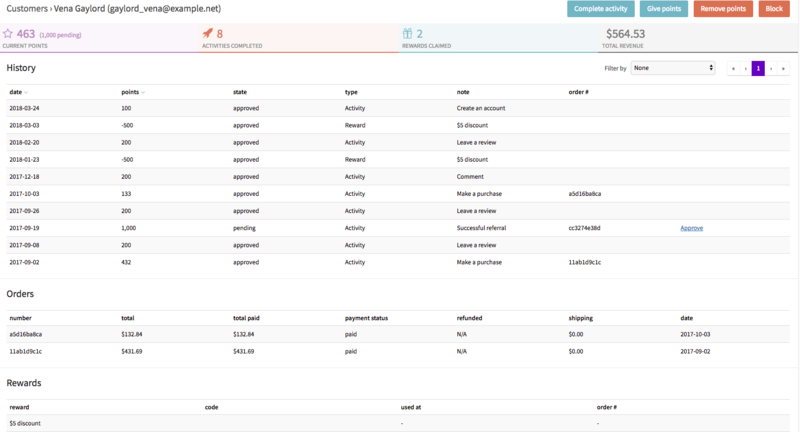 You can now use the Customer Tooltip to display the details of a customer’s order. By hovering over an order in the customer page, the tooltip allows you to see a breakdown of the points provided for the order. This improvement allows you to understand why an order earned the points it did. If your customer has two accounts with two different emails, you can "merge" the customers by removing all the points from one customer and adding them to the other version. If the other customer continues to receive points, simply block that customer. This will stop the actual customer accidentally signing in to the wrong account. For those using the Shopify platform, you can locate the member(s) in question and select the "erase personal data" option. This will also delete them from LoyaltyLion. Otherwise, we don't have a way for you to delete customers right now, however, you can tell us on support@loyaltylion.com which one it is & we can delete it for you. We can’t delete the customers from LoyaltyLion as they were created on your platform. We don’t have our own customer accounts, we pull customers accounts into our system. So as soon as a customer creates an account on your platform, we will add them to LoyaltyLion. Q.I have a lot of SPAM customer accounts, can you delete them for me? If you are getting a lot of spam registration, I would advise reaching out to your e-commerce platform account manager to see if there is anything that they can do (i.e. setting up a captcha upon signing up) as the accounts were created on their platform. If the customer details change, LL will update our records automatically as we will get a notification from your store. Normally this should only take a few seconds, however, it will depend on how quickly your store sends us the message. Q. [Shopify] How can I reset my customer's password? You can reset a customer's password in your Shopify admin - there's a guide for that here. You can see what rewards have been claimed by individual customers in their tab at the bottom of the page. Also, to see who has claimed and used the voucher, go to your rewards page > click "manage voucher codes" on the reward > click "existing codes". Orders can normally be cancelled and refunded separately. Its "state" is "declined" - the points are still visible, but not added to the customer's point total. Once the order is fully refunded, the applicable spend is 0 - so they earn 0 points for the order. A partial refund works the same way - the points are reduced to match the amount that the customer has actually spent (after refunds). 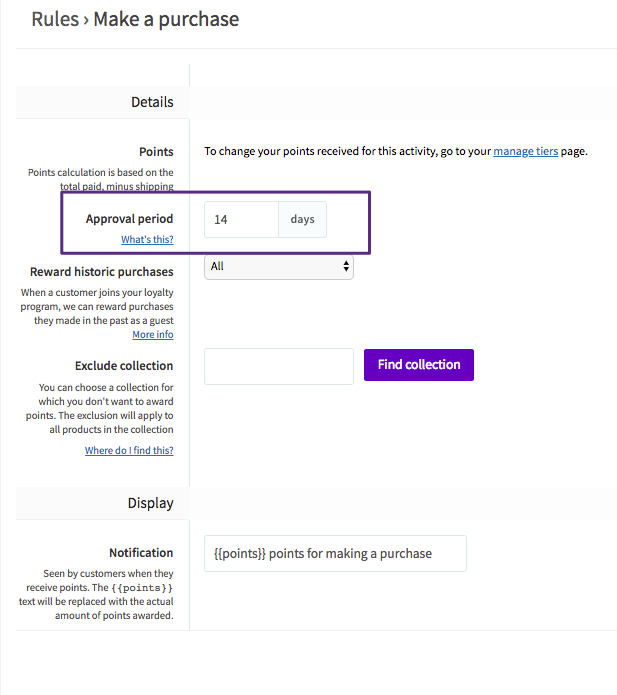 To avoid customers abusing the program we have designed a ‘pending points’ feature which prevents your customers from using their points to collect a reward then returning the item. Pending points are points which the customer has been rewarded but cannot access immediately. The waiting time is intended to make sure your customers don't return or cancel their order before we allow them to spend their points. Enter the desired number of days next to "Approval period"
If you want to change all your customers' points (eg. divide all their points by two) we strongly advise against it. A better alternative in this scenario would be to double the cost of rewards. Your customers will log in and see a drop in their points. You will almost certainly experience complaints from concerned customers asking where their points have gone. Behavioural economics has shown that higher numbers of points motivate customers more than lower amounts even if the reward they achieve is the same so by adjusting your program you may make it less successful. If you change the cost of the rewards instead of the customers' point balance you will achieve the same result immediately.